Introduce students to the knowledge and fundamental skills they need in the sanitary and drainage areas. End-of-chapter theoretical and practical tasks enable students to demonstrate their understanding of key topics and to engage in practical tasks. Regular WHS references focus on important issues faced in the industry and the workplace. This 2nd edition has been updated to meet the requirements of the AS/NZS 5601:2013 standards and the training requirements from the CPC Training Package. 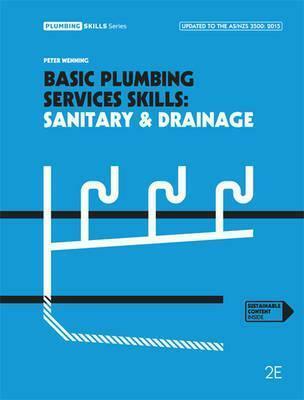 The Plumbing Skills series provides learners with the knowledge, skills and awareness they will need to be successful in the plumbing industry. It develops problem-solving skills, combining safe work practices with professional skills and a thorough understanding of how and why things are done in a certain way. WHS boxes identify critical points for concern; Sustainability boxes lead on up-to-date environmental information; and Employability boxes outline the responsibilities of employees. References to AS/NZS 3500:2015, referred to in the Plumbing Code of Australia, prompts familiarity with the codes throughout their training.